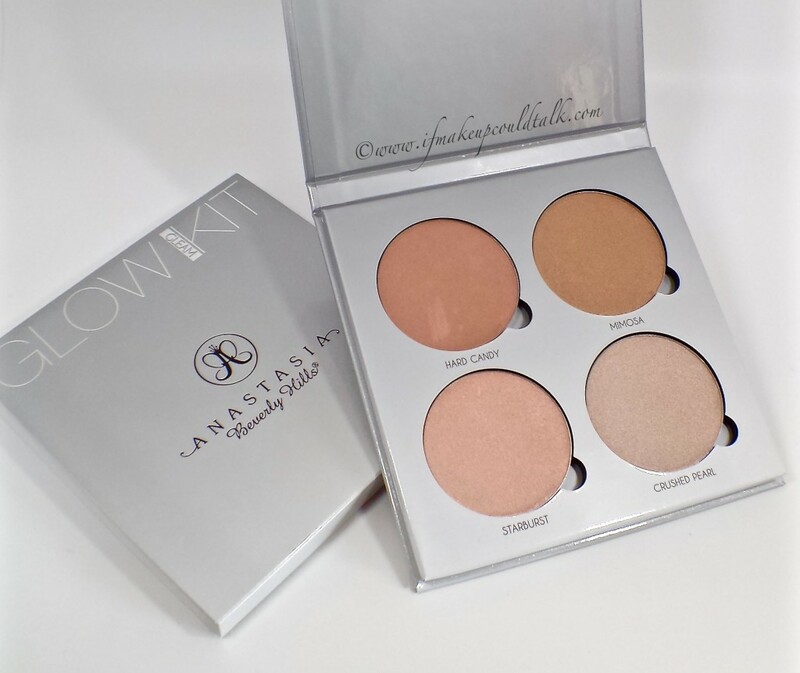 Anastasia Beverly Hills Gleam Glow Kit review and photos. Some of the most enticing makeup products are highlighters/illuminators. 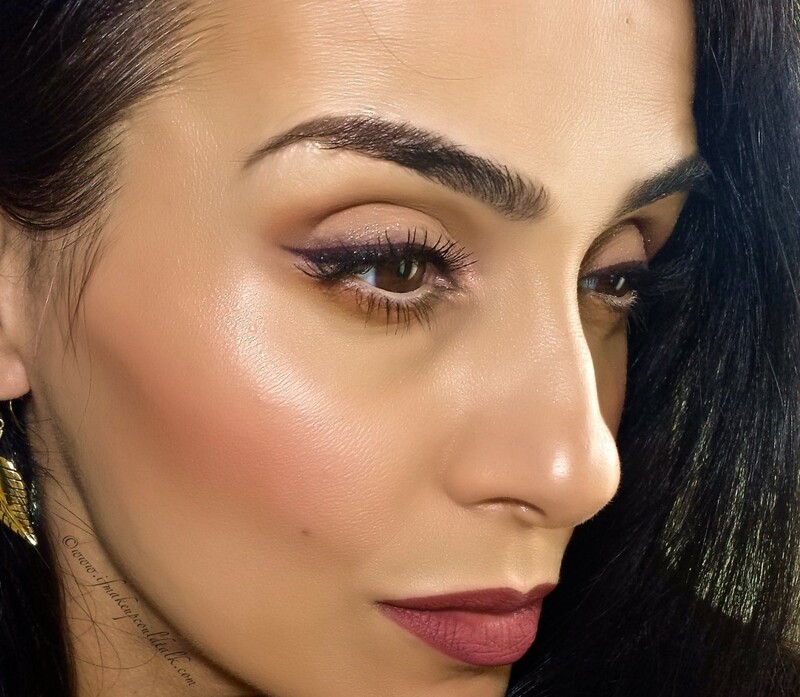 Despite the overuse of these gleaming powders on Youtube and Instagram, a decorous approach to highlighting can truly enhance any makeup look. 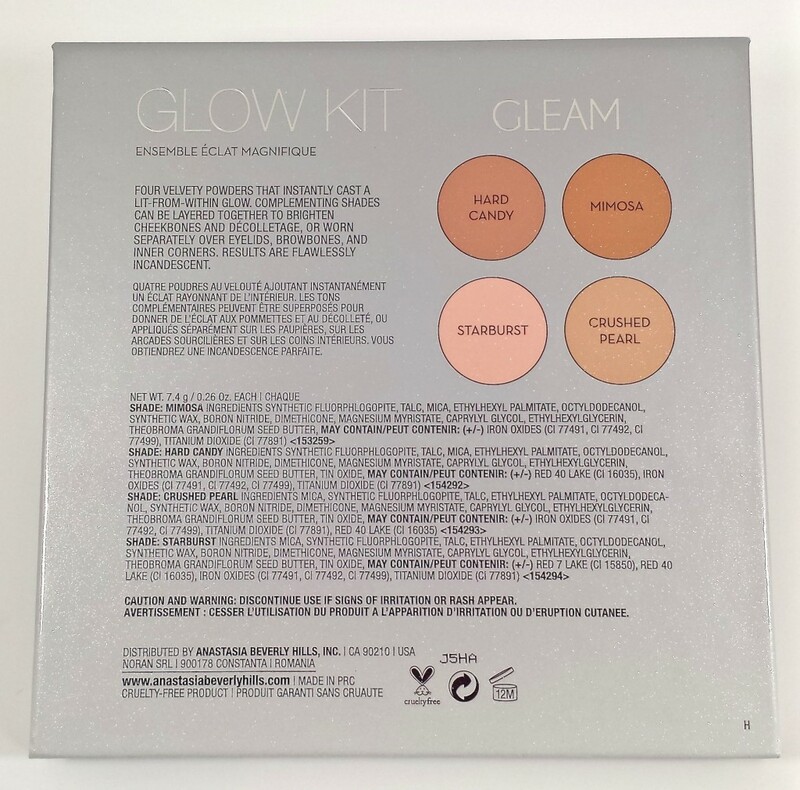 Anastasia Beverly Hills Gleam Glow Kit ($40 USD/ 7.4g x 4) provides the perfect means for anyone to regain vitality no matter one’s age, skin texture or complexion. First things first–the price/amount ratio is outstanding (7.4 grams /$10 each) for a higher-end brand. All four colors are silky smooth. The powders are moderately packed into the pan–no need to dig your brush in for color payoff. Colors seem to have a pearlized finish without any shimmer or sparkle. 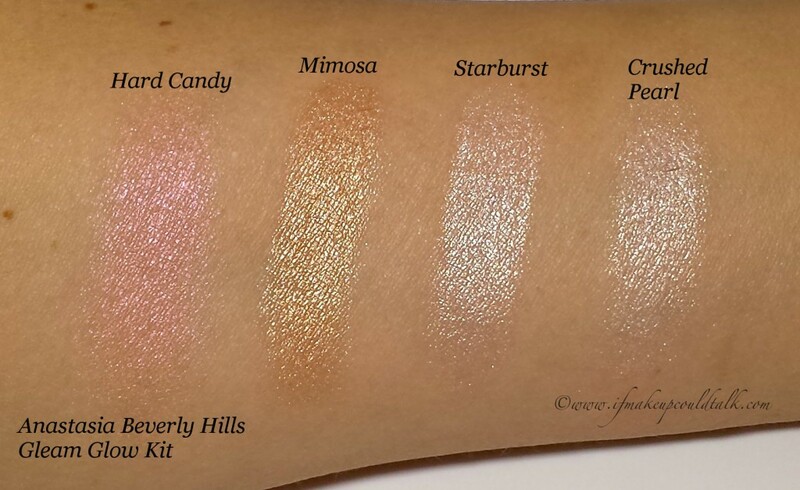 Gleam is the cooler/pinker version out of the two quads offered. Ideal for light/medium/olive complexions. That Glow (the other quad) is ideal for dark/warm complexions–however, with the right touch, these colors can work on everyone. Colors can be worn separately, mixed together, or utilized as eyeshadows. Hard Candy (my favorite) transforms any coordinating blush into a luminous gem. Mimosa can be used in the same fashion with any bronzer. When worn dry, colors last a solid six hours before signs of fading occur. However, when applied with a slightly dampened brush, lasting power is significantly increases for 8-10 hours. Layers over a cream base beautifully without any patchiness. 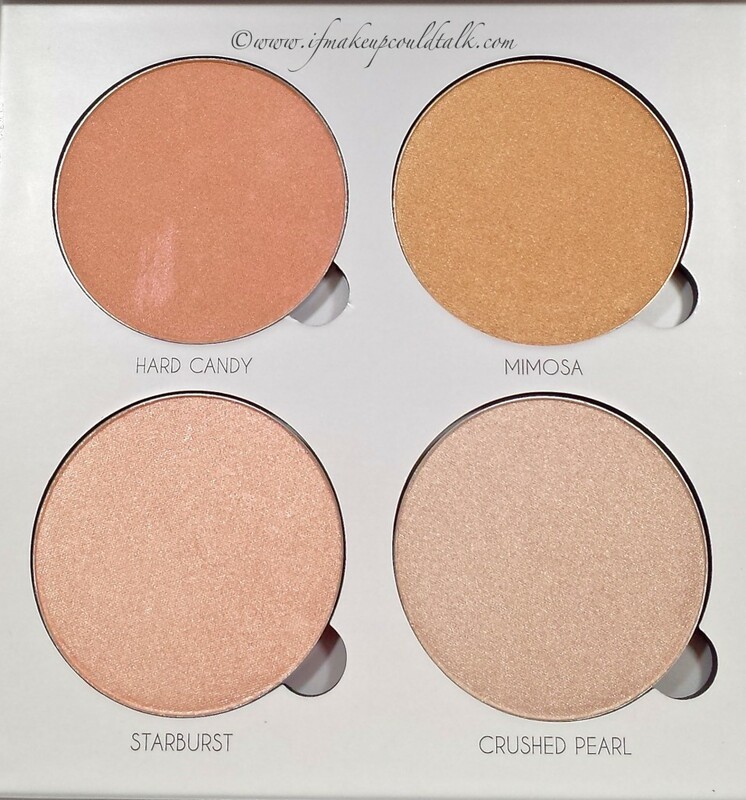 Mixes beautifully with other highlighter and blush brands. Great investment for any makeup artist. Removable pans easily pop-out to fit into separate palettes. Formulated without parabens or mineral oil and cruelty-free. Unlike her eyeshadows, which are made in the USA, this palette is made in PRC (People’s Republic of China-aka: China)–presumably, that is why the cost is so affordable. Starburst and Crushed Pearl look indistinguishable on the skin. A pale golden peach color option would have been nice addition. Hard Candy: is “a mood-changing golden peach with a pink pearl reflective finish.” This color was the reason for my purchase–I have a particular weakness for pink highlighters, they bring some oomph back into my sallow olive complexion. Personally, I do not see a strong peach presence in this color. Regardless, the heavy pink opalescence surprisingly blends beautifully with other highlighters and blushes in my collection. My favorite highlighter combo is Hard Candy mixed with Dior Cosmopolite Illuminating Powder (reviewed here). 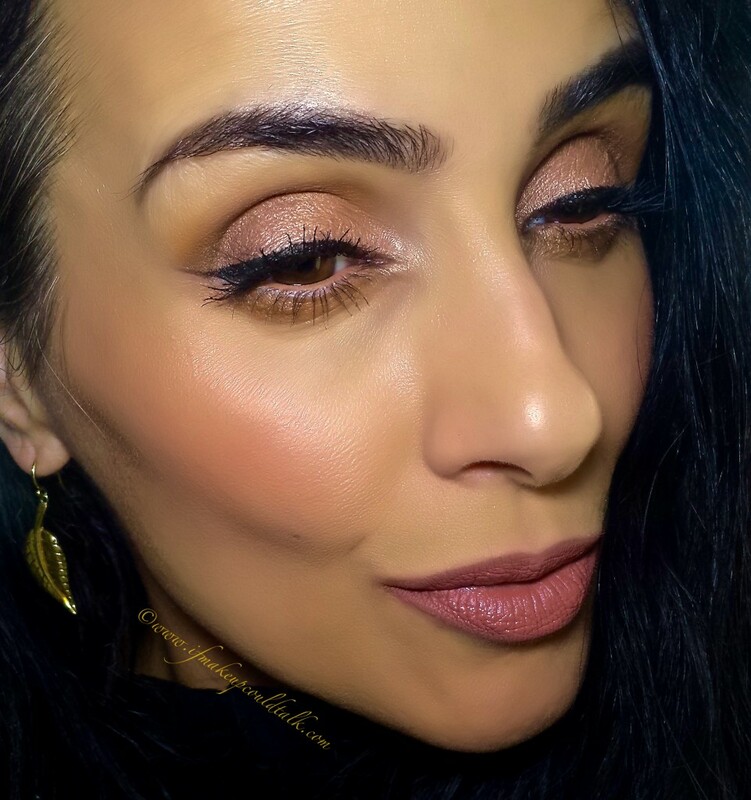 Mimosa: is “a radiant golden peach with a metallic finish.” This particular color reminds me of Bobbi Brown Bronze Shimmer Brick, in that the metallic sheen is quite evident and a very light hand should be utilized during application. Once again, the peach coloring in the description escapes my eye, however, Mimosa pairs nicely with MAC Uninterrupted for my lower lash line color. When used as a facial highlighter and eyeshadow, I found the heavy golden tones of Mimosa were able to subdue the distinct pink radiance of Hard Candy (see below). Starburst: is “a rush of cool pink with an iridescent finish.” As stated above, Starburst and Crushed Pearl are so similar, I cannot tell them apart on the skin. Both colors deliver the same luminous effect and blend beautifully on the skin. Crushed Pearl: is “a glimmering pink and silver with a crystalized chrome finish.” Although, not as intense as ABH regular illuminators, this shade holds its own when seeking more dramatic results. Hard Candy mixed with Mimosa on the cheekbones, mobile lid and center of the nose with Starburst as an inner corner highlight (overcast day). Hard Candy mixed with Crushed Pearl on the cheekbones and inner corners (sunny day). Makeup would tell you Anastasia Beverly Hills Gleam Glow Kit is–as the young kids would say–“THE BOMB.COM.” The packaging, color selection, payoff, substantial amount, beautiful radiant finish and reasonable price, are all stellar. If you are on a beauty budget, just starting off in makeup, or even an expert makeup artist, this kit will certainly make a wonderful addition to any personal collection. Until next time, be well, stay safe, and be happy. *IfMakeupCouldTalk.com is not affiliated with any brands mentioned, all products were purchased by me. *This post contains affiliate store links. *Compensation is not given for any reviews. *All opinions are my own and based on my experiences. *All photos are property of IfMakeupCouldtTalk.com unless otherwise noted. *IfMakeupCouldTalk.com photos and written content cannot be used for any other social media and/or publications.